The Department of Biotechnology at the TERI SAS was established to facilitate capacity building in the field of biotechnology and to address prevailing lacunae in education policies that are critical for its balanced promotion. The department focuses on inculcating scientific temper, analytical reasoning, original creative thinking and logical thought process critical for research. It promotes sensitization to issues concerning ethics, regulations and management vital to biotechnology. Through an academically rigorous and interdisciplinary environment, the department seeks to meet national requirements in basic science as well as agricultural and environmental applications. The department offers MSc, and PhD programmes in biotechnology. This is achieved through a combination of interdisciplinary curricula as well as intensive laboratory work. 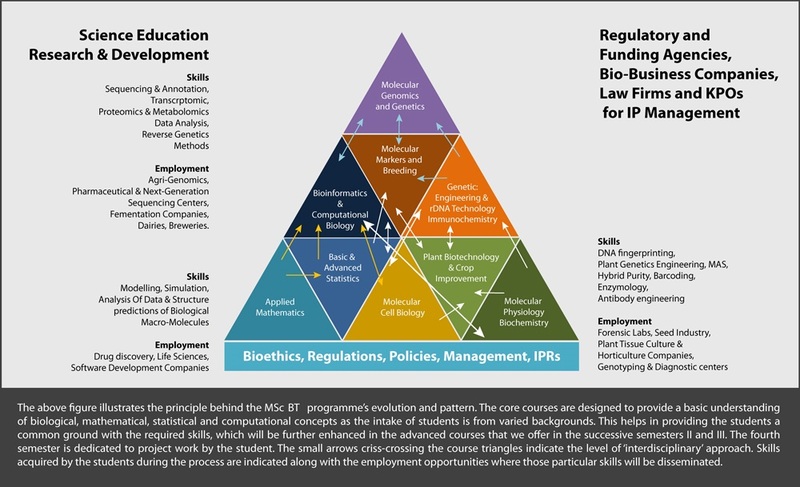 Through its unique pedagogical methods, the academic programme allows transferability of acquired skills in domains unrelated to biotech sectors. Students are expected to have both specialized knowledge and practical experience for addressing contemporary problems in both academic and industrial setting. To advance education and research in Plant Biotechnology and explore sustainable solutions for agriculture, environment and energy sectors. Promote an understanding of interdisciplinary approaches and technologies used in the analysis of complex biological information. Impart rigorous hands-on training in both laboratory-based methods and bio-informatics tools for biological research. Sensitize students about multifaceted regulatory issues and ethical concerns related to biotechnology. A research-oriented learning that develops analytical and integrative problem-solving approaches. Specialized knowledge and practical training to address contemporary problems in academia and industry. Awareness of ethical issues and regulatory considerations while addressing societal needs for sustainability. Molecular biology tools and experimental strategies, theoretical understanding of OMICS approaches. DNA profiling and bar coding techniques, generation of transgenics, marker assisted breeding and selection, testing of hybrid purity. Structural and functional characterization of biological macromolecules. Bio-business companies, breweries, seed industries, pharmaceutical companies, dairies. Regulatory and funding agencies, law firms and knowledge processing offices (KPOs) for Intellectual Property (IP) management. TERI SAS thrives to impart a substantial message that “we need to unite and help each other, to sustain a holistic dwelling”. Students are made to realize that the concepts like inter- disciplinary approach and sustainability can be practiced in reality and imbibed as a culture for the betterment tomorrow. The curriculum is designed so thoroughly that it reflects understanding of faculty members in terms of subject and the level of understanding required, by the student, to excel the subject. Study trips organized to gain the insights of the subject prove highly beneficial and are fun filled experiences that leads to realization of upcoming frontiers and the ways to achieve them. Conclusively, TERI SAS believes, that students being a crucial asset of the future are worthy of healthy mindset and outstanding skill set, to lay foundations of society at par excellence. The MSc programme in Plant Biotechnology was conceptualized and initiated with seed funding from the Department of Biotechnology, India by the TERI SAS in 2008. This programme is inter-disciplinary and is designed to empower students with technical skills and generate capacities and career opportunities with an emphasis on sustainable development. The programme focuses on core subjects like molecular plant breeding, genetic engineering, genomics, plant tissue culture, proteomics and molecular and cell biology. Simultaneously, the students are also trained in applied mathematics, bioinformatics, bioethics, computational biology, intellectual property rights and statistics to enhance their skills and enable them to integrate pure science and emerging technologies successfully. The programme aims to create a pool of well-trained professionals in plant biotechnology for both academia and industry. Classroom lectures and intensive, hands-on laboratory courses during the first three semesters are supplemented with classroom discussions, guest lectures by experts and discussion fora. During the fourth semester, students will be involved in full-time laboratory-based research for their major project.